Classic Greek styling renders the Ithaca Pub Stool by Howard Miller the perfect stool for the Ithaca Pub and Game Table but it is also appropriate for a variety of settings. It is finished in Hampton Cherry with a lightly distressed look. The cushy brown faux leather seat makes it comfortable as well as stylish. 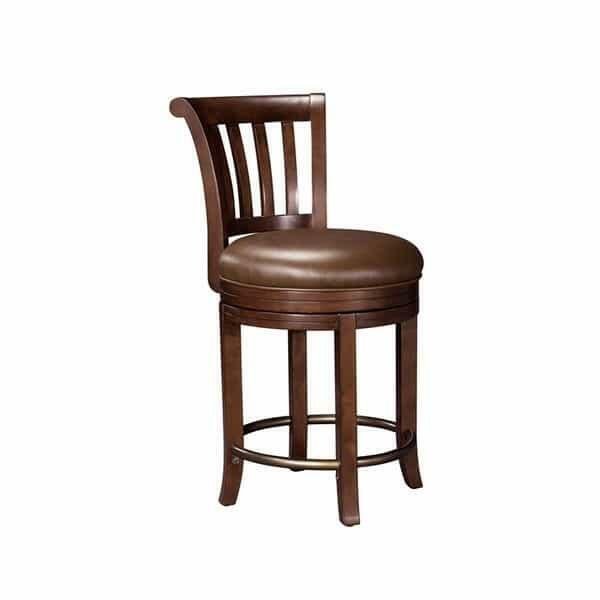 The Ithaca Pub Stool has an antique brass-finished metal footrest and a zero return swivel. Take a seat, the games are about to begin. This item ships via UPS / FedEx. Most delivery times within the Continental U.S for in stock bar stools range from 2-5 business days depending on location. All in stock bar stool orders received before noon will ship that SAME DAY.